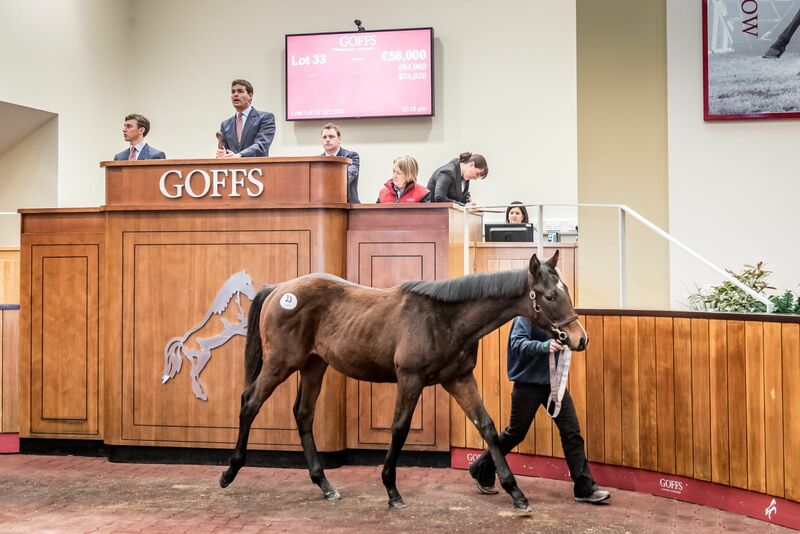 Europe’s 2019 sale calendar got under way today at Doncaster with the opening day of the Goffs UK January Sale offering a session of National Hunt Mares and Foals to a large buying bench of purchasers. Despite this year’s catalogue not featuring a major dispersal, with the 2018 sale hosting the Trull House Stud Dispersal, the sale’s foal session posted the third highest average in the sale’s history, finishing at £11,568, just short of 2017’s foal average of £11,664. However, today’s trade was highly selective, continuing the trend seen across European sale venues last year, but those that held appeal were the subject of strong and sustained demand in the ring. Topping today’s opening session was Little Lodge Farm’s Kayf Tara colt from the family of Grade 2 winners Definite Ruby and Stormyfairweather (Lot 33) who sold to Brendan Bashford Bloodstock for £58,000. Selwood Bloodstock’s Blue Bresil colt out of the Gr.2 placed mare Mickie (Lot 107) was another to feature when knocked down to Kevin Ross Bloodstock for £50,000. The second and final day of the Goffs UK January Sale will commence tomorrow from 10am and will offer a day of Horses-in-Training and high-end Point-to-Pointers.